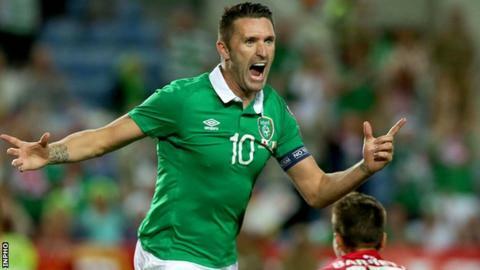 Republic of Ireland captain Robbie Keane has urged his team-mates to grasp their second chance of making the Euro 2016 finals through the play-offs. The 2-1 defeat by Poland on Sunday left the Republic third in the group and awaiting the 18 October play-offs draw. "Look, we've been successful in the play-offs," said the LA Galaxy striker. "Having that hunger and desire, knowing that there's a massive prize at the end of it - some players never get the chance to play in these competitions." That play-off success came against Estonia four years ago, with the Republic winning 5-1 on aggregate to make the Euro 2012 finals. Martin O'Neill's side needed a win or a draw of 2-2 or higher in Warsaw to clinch automatic qualification for France. They are now likely to face Ukraine, Croatia, Bosnia, Sweden or Denmark over two legs next month. "When you're in with a chance and you think you can take second spot, then of course it's a disappointment," added Keane. "We've been lucky enough that we have quite a few who know what it's like, the atmosphere that gets created around it for everybody. "To have a European Championship on your CV, that's an opportunity the lads certainly have to be mindful of. "We all have to go on thinking we have a great chance regardless of who we get because we're a good team." The Republic will go into the play-off first leg without suspended pair John O'Shea and Jonathan Walters.